Delightful, MOVE-IN READY, Split 3/2 POOL home in the heart of scenic Dogwood Mountain (no HOA), deeded access w/community dock to splendid spring-fed Lake Gertrude. 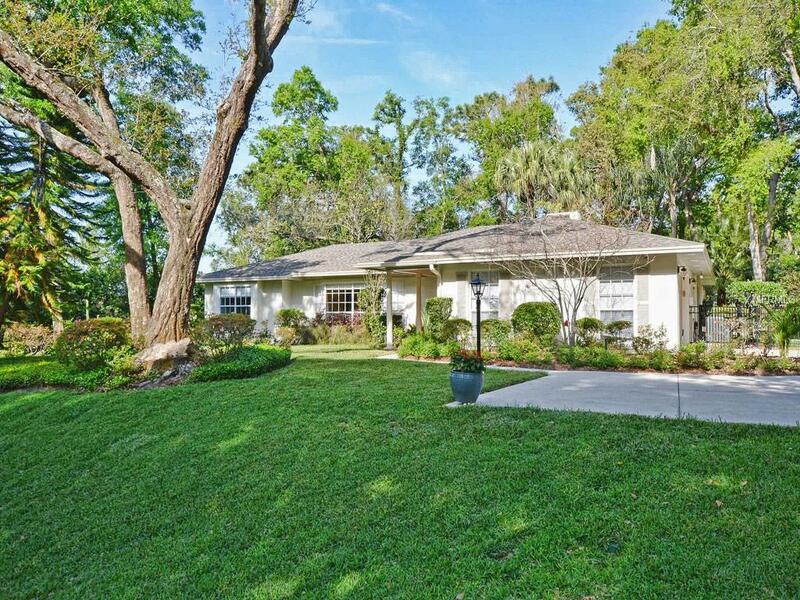 Situated on nearly half acre, approx 1 mile to historic downtown Mount Dora. From the moment you come up the driveway you will feel the presence of an oasis set in paradise. Entering home you are greeted with Brazilian Cherry hardwood floor covering much of living area. Updated kitchen & bathrooms include granite counter tops, hardwood cabinets & decorative fixtures. Family room w/traditional brick gas fireplace framed w/built-in bookcases. Crown molding in many areas. Living room w/tray ceiling & recessed lighting. Roof replaced 2013, TRANE AC 2011, water heater 2016, pool pump 2018. Kitchen includes newer stainless steel appliances, gas stove, recessed lighting & pass-thru window to lanai. Master bedroom suite w/pocket door entry (in-law suite possibilities),2 separate sink areas, walk-in closet & exterior sliding glass door opens to walled garden area w/gated access to yard. French doors from both family & dining/living room flow to the spacious covered back lanai & onto screened pool area. 12vLEDpool light.Outdoor shower. 7x9.5 attached storage/workshop. Garage boasts ac vent, pulldown ladder for attic access, 2 overhead storage areas, built-in cabinets, tub sink, newer insulated garage door w/upper windows for natural light. Sprinkler system w/multi zoned timer. Perimeter invisible fence, 3 doggy doors. AND then there are the GARDENS.